As mentioned in our first post of this lessons learned series, the initial stand-alone Visual Production Web Viewer (which we developed as an add-on to NAV 2013, rather than as add-in for NAV 2013 R2) has an own proprietary toolbar. When moving to NAV 2013 R2 and when achieving a fully embedded add-in solution, we replaced all action buttons of that toolbar by buttons in the Dynamics NAV ribbon. In this context an annoying issue – it is not specific to the Dynamics NAV Web Client, but nevertheless it isn’t less annoying – is the fact that you cannot design images by your own for the action buttons. Instead, you are forced to select out of hundreds of predefined images and hopefully you find the ones that fit the semantics of your actions best. This is not only a frustrating job but the main crux is that the user will be almost certainly faced to action buttons with the same images but with different actions behind. This might be very confusing from the user’s point of view. As of yet, we have no solution to this. But as a developer, we would pledge for achieving more flexibility here. 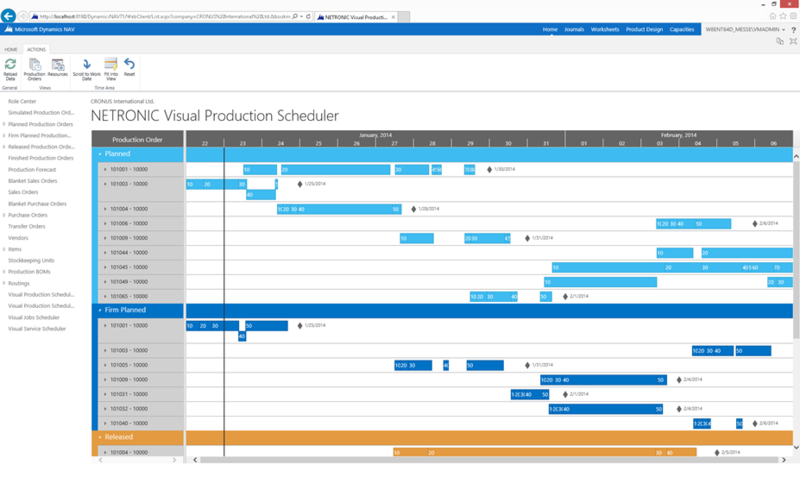 Another next step will be extending the simple VPS Web Viewer to a sophisticated web editor with similar drag & drop functionaly as our .NET-based Visual Production Scheduler for the Dynamics NAV Windows Client has. This means we will add histograms to visualize the capacity utilization and of course we will provide ways to edit data interactively. Of course, we will continue to share the experiences made in this blog post series.